WESO Tower Downed in Rare "Derecho"
*An unusual weather system with winds that may have hit 120 miles per hour took down a radio tower in central MASSACHUSETTS last Wednesday. WESO (970 Southbridge) lost its 240-foot guyed tower in the town of Dudley when the "derecho" (a system of downburst clusters that are part of a heavy windstorm) ripped across southern New England. The National Weather Service says it was the first derecho in the region since 1995. 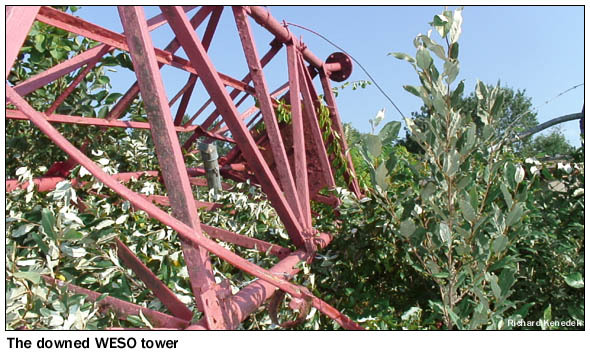 WESO went silent when the tower went down, but returned over the weekend at low power from a makeshift wire antenna. Chief engineer Rick Kenadek and engineering consultant Kurt Jackson were working to get a temporary tower up, and planning to replace the downed tower, which dated from 1955. Kenedek tells NERW that the winds loosened one of the tower's guy wires, bringing the rest of the structure down. We'll keep you posted as WESO rebuilds. 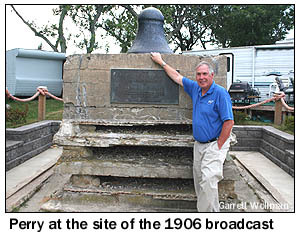 *On the South Shore, the weekend was devoted to a celebration of the upcoming centennial of Reginald Aubrey Fessenden's Christmas Eve 1906 broadcast from Brant Rock in Marshfield. 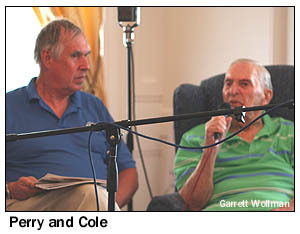 Saturday's highlights included a live WATD (95.9 Marshfield) broadcast from the Daniel Webster Estate and Heritage Center, featuring New England broadcasters past and present, including WHDH's Fred B. Cole (now 91), station owners Barry Lunderville, Dennis Jackson and Marshall Sanft, and a telephone hookup with a parallel Fessenden celebration taking place in Scotland. 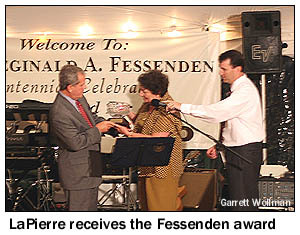 A gala party Saturday night was highlighted by the presentation of the first "Reginald A. Fessenden Broadcasting Award" to WBZ's Gary LaPierre, and several tables full of his WBZ colleagues turned out to salute LaPierre for the honor. We're sorry we couldn't make it to Marshfield - but we're grateful to NERW correspondent Garrett Wollman for showing up with his camera and sharing his pictures with us. *The week's other big story from the Bay State was, of course, last Monday's announcement that Greater Media, Nassau and Charles River Broadcasting had finalized the transactions that will give Nassau the WCRB call letters and classical format and the 99.5 Lowell facility that's now Greater Media's WKLB. The WKLB calls and country format will move to WCRB's present 102.5 Waltham facility, and Greater Media will get Nassau's WTHK (97.5 Burlington NJ), soon to become a full-market Philadelphia move-in. The sale price of WCRB to Greater Media hasn't yet been disclosed, but there's reliable word that the Nassau/Greater swap includes a $20 million cash payment from Greater to Nassau. In addition to the cash, Nassau will enter the Boston market for the first time with the WCRB acquisition. On its new 99.5 signal, WCRB's classical format will reach more deeply into southern New Hampshire (at the expense of coverage in downtown Boston, on the South Shore and in the western suburbs), linking up with Nassau's four-station "W-Bach" network on the Maine coast. We'll get to the WTHK piece of the deal later in this week's column. *One more piece of big news came from Entercom's WAAF (107.3 Westborough), where afternoon jock Mistress Carrie has, through the miracle of Webcasting, become one of the most popular radio personalities among the U.S. troops in Iraq and Kuwait. \In September, Carrie will travel to the Middle East to spend 12 days embedded with the Massachusetts Air National Guard there, broadcasting back to Boston several times daily via satellite phone. She's currently soliciting phone cards from listeners to take to the troops - along with loads of WAAF goodies. *In NEW HAMPSHIRE, we hear that director of engineering John Huntley will be leaving New Hampshire Public Radio on September 1, heading to Illinois as his wife takes a new job out there. In his years at NHPR, Huntley's overseen a huge expansion of the statewide network's reach, including brand-new signals in Nashua and Jackson, and he'll leave some pretty big shoes behind as he departs the Granite State. *The big story in NEW YORK last week was Air America's announcement that it will change flagship stations at the end of August, when its current lease with Inner City Broadcasting's WLIB (1190) expires. Beginning September 1, most Air America programming will instead air on Access.1's WWRL (1600), displacing a daytime lineup there that currently includes leased-time health shows (10 AM-3 PM) and several syndicated talkers. WWRL's current morning show, featuring Sam Greenfield and Armstrong Williams, will remain in place, as will its weekend Caribbean music programming and, likely, its carriage of the late-night Alan Colmes show. So what will be heard on WLIB come September? Inner City's not saying yet, but the rumors are very strong that the station will end up with a non-Air America lineup of other progressive talkers, likely with the involvement of former Clear Channel Radio boss Randy Michaels. *Upstate, the Rochester broadcast community is mourning longtime WOKR (Channel 13) meteorologist Bill Peterson, who died Saturday (Aug. 5) at 58 after a long, public struggle with cancer, lung disease and heart disease. Peterson came to Rochester in 1982 from his native Wisconsin and never left channel 13, becoming the station's chief meteorologist, a post he held until his health problems forced him to retire in 2001. Meanwhile, across town at third-rated WROC-TV (Channel 8), the concept of staff longevity took a few more hits last week. Reporter/anchor Ty Chandler (one of several staffers who came over when WROC took over operation of Fox affiliate WUHF) is the latest to depart the struggling station. *In western PENNSYLVANIA, the format didn't change at Connoisseur Media's WUSE (93.9 Fairview), but just about everything else at the Erie-market country station did. As of last Monday, "US 93.9" has given way to "The Wolf," with new calls WTWF. The station's airstaff is expected to remain in place, though it's running jockless right now. At sister station WRTS (103.7 Erie), night jock Dave Mazur is on his way to Toledo, taking the night gig at WVKS (92.5) that was vacated when Brian "Munchie" Donovan moved to Hartford and WKSS. In Pittsburgh, the brokered-time "Locker Room" morning show on WBGG (970) is history, replaced by Fox Sports Radio network talk for now. Down the street at WAMO-FM (106.7 Beaver Falls), DJ Boogie gets promoted from assistant PD to PD, retaining his afternoon on-air shift as well. On the Maryland border, Verstandig's WPPT (92.1 Mercersburg) has flipped from top 40 ("The Pulse") to classic country. There's a new local morning show at Greater Media's WPEN (950 Philadelphia), featuring new PD Gregg Henson and former Jets/Seahawks quarterback Glenn Foley, along with producer Michael Checkoway. *Just a few bits of news from CANADA this week: Blackburn Radio is asking the CRTC to let it change the frequency of its Windsor relay of CKUE (95.1 Chatham). It seems that the high-powered synchronous operation at Windsor (currently running 1950 watts on 95.1) is causing interference to the main Chatham signal along Highway 401 and receiving interference from co-channel WFBE in Flint, Michigan - so Blackburn wants to move the Windsor CKUE-FM-1 signal to 100.7, where it would run 9 kW DA/74.5 meters, with an improved signal into Detroit as well. And in Ottawa, the FM dial just keeps filling up: Aboriginal Voices Radio is testing its new signal at 95.7, while the new CIIO (104.7) is on the air testing with tourist information as "InfoRadio Canada." After just three weeks on the air, veteran MAINE morning man Mark Persky is already gone from Nassau's "Frank" (WFNK 107.5 Lewiston). No details yet on the hasty exit...stay tuned! 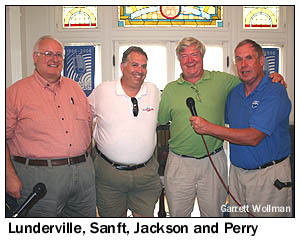 NEW JERSEY's newest FM station will be around for a while, after all. The FCC has granted a full five-year experimental license to WA2XMN, the experimental station on 42.8 MHz at the Armstrong Tower in Alpine. Steve Hemphill, the Philadelphia engineer who came up with the idea to revive the old FM band and who built the WA2XMN Phasitron transmitter, says the plan now is to try to recreate Armstrong's networking experiments from Alpine to various New England mountaintops, beginning with Mt. Asnebumskit in Paxton, Mass. The big news in NEW YORK came as no surprise, really; everyone in the business knew that ABC wanted WEVD (1050 New York) as the Big Apple flagship for ESPN Radio. Now we know the price and the terms under which control of WEVD will pass from the Forward Association to the Disney gang. ESPN programming will begin full-time on 1050 September 1, under an LMA that gives Disney the option to begin negotiations for a $78 million purchase of the 50,000 watt station any time in the next two years. Forward officials say their goal is to return to a focus on their print offerings (the weekly Forward), using the money from WEVD to support the struggling newspaper. The Forward Association reportedly wants to become a non-profit, according to the "Save WEVD" folks who have been fighting for months to keep the present quirky talk lineup in place on 1050. So what about those call letters? It's a safe bet that labor leader Eugene Victor Debs wasn't an Islanders fan, so we'd expect a possible change (though Disney never did flip its Radio Disney outlet on 1560 from the old "WQEW"). M Street beat us to the punch in noting that the logical "WSPN" is in use on FM up in Saratoga Springs, at Skidmore College's 91.1. Elsewhere in NEW YORK, there are some unhappy listeners and viewers in the public broadcasting arena, thanks to a pair of decisions to merge operations in the New York City area. On the TV side, the board of directors at WLIW (Channel 21) on Long Island voted last week to approve a merger with Newark, N.J.-licensed WNET (Channel 13). By joining forces with the bigger WNET operation, WLIW officials say, they can avoid the massive financial burden of the upcoming DTV conversion. Long Island viewers say they're worried about losing the distinctive programming (in particular, British comedies) that WLIW has long offered. WLIW board member Anne Ellis resigned before the vote on the merger, and lawmakers are being asked to examine the deal. A few more bits of news from the city: John Fullam has resigned as general manager of Clear Channel's WHTZ (100.3 Newark) and senior VP for regional operations for Clear Channel. No replacement has been named. Fordham University's WFUV has been denied, again, in its attempts to put an on-channel booster for its 90.7 signal in Manhattan. And on the TV side, there's finally more DTV action: WPIX-DT 33 had its license to cover granted this week, while WNET-DT 61 is right behind. That loud sucking sound you're hearing near Boston's Copley Square is coming from the American Radio Systems headquarters, as ARS keeps buying and buying and buying. Within the last few weeks, ARS has spent about $67 million buying KXOA-AM-FM/KQPT-FM Sacramento, KRBT-FM/KNAX-FM Fresno, and KOQO-AM/FM Fresno. Now ARS has turned its attention back to home, spending a reported $24.9 million to buy WAAF (107.3)/WWTM (1440) from Zapis. WAAF targets the Boston market with a hard-rock format, serving a small niche, but one that it has all to itself. WWTM is all sports, with a signal that doesn't reach anywhere east of Worcester County very well. They join ARS' existing stable of stations: WRKO (680), its flagship talker; WEEI (850), which is all sports; WEGQ (93.7), the Lawrence-licensed 70s outlet; and WBMX (98.5), the hot AC "Mix 98.5."